They can stand in line (sort of), use indoor voices (perhaps), and are capable of sharing (rumor has it), so the Click Clack critters are ready for school…but is school ready for them? 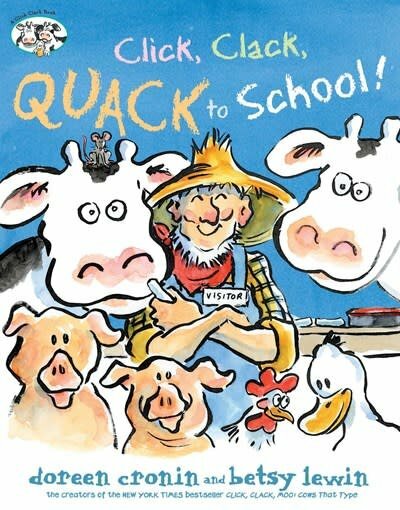 A charming addition to the award-winning Click, Clack series from the New York Times bestselling and Caldecott winning team who brought you Click, Clack, Moo and Click, Clack, Surprise! Farmer Brown has been invited to be a guest at the elementary school’s Farm Day! The animals excitedly practice their best classroom behavior: standing quietly in line, using their inside voices, and learning how to share. But then they find out that farm animals aren’t actually allowed in school (who knew they were considered a health code violation?!). Rules are rules, so Farmer Brown goes to school solo—or so he thinks…for while our favorite barnyard bunch don’t get high marks in rules, they do excel in disguise.